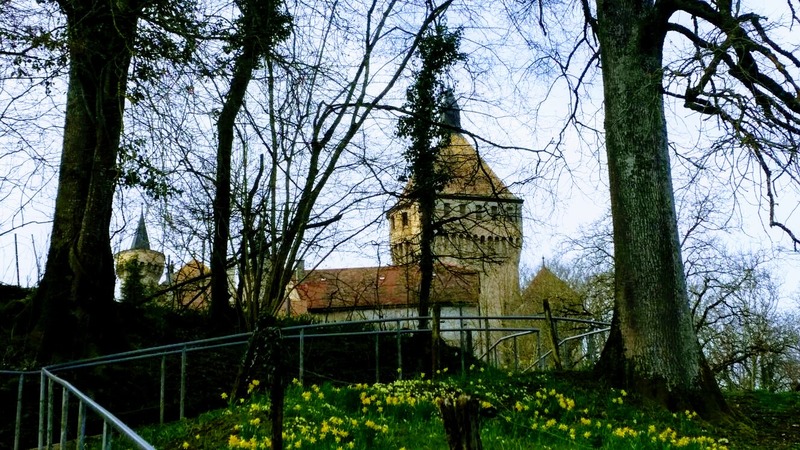 This walk links Le Chateau de Vufflens and the lake town of Morges as it follows the Morges river. 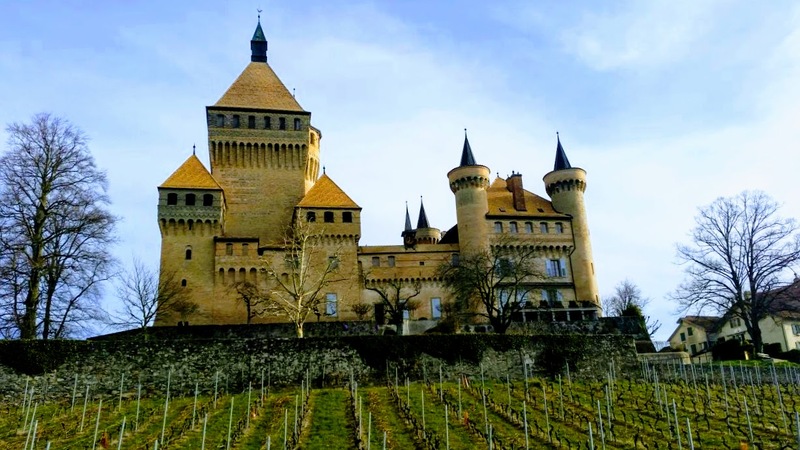 It is typically walked from Morges up to the Chateau, however we decided to park near the Chateau and walk downhill toward Morges as we had 4 young children with us (two 3 year olds, one 5 year old and one 6 year old). You can find the start of the trail just behind the chateau. We parked, here, near the commune building in a public parking area and were easily able to find our yellow walking man stickers which indicated we were on the trail. The GPX coordinates can also be downloaded from this website and used in your phone with an appropriate app. 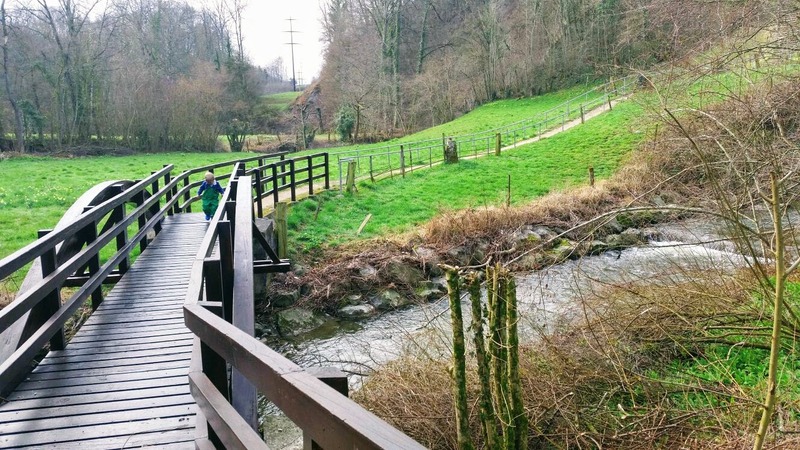 The hike starts with some steps leading downhill through a field and then across a wooden bridge (photographed above and below in the distance). Vufflens-le-Chateau photographed behind Lucas. 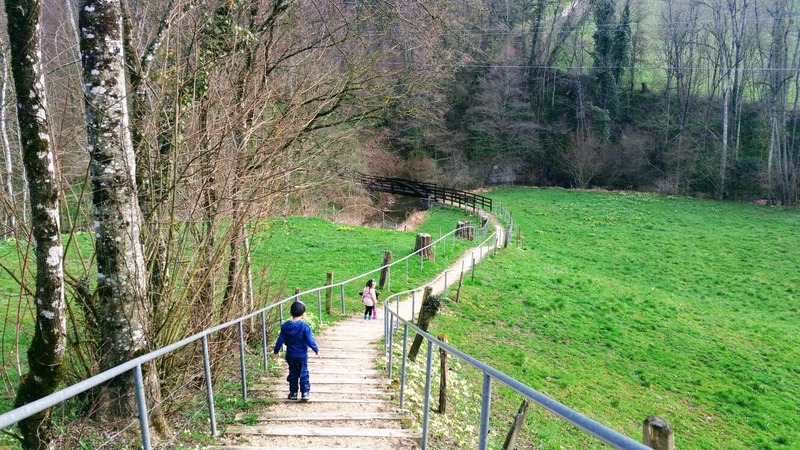 The steps leading down from the chateau at the start of the trail can be seen. After crossing the bridge you will venture through some vineyards before heading back closer to the river. 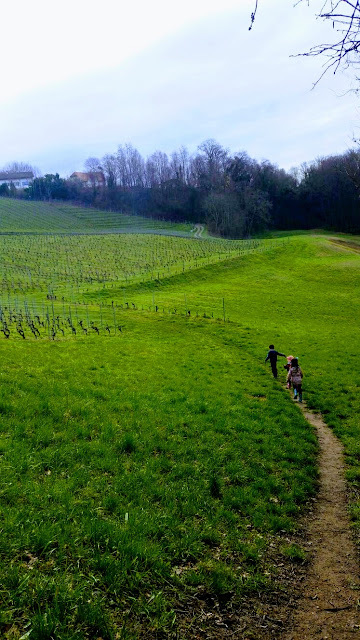 Standing in the vineyards along our trail with the chateau behind us in the distance. The path straddles the Morges river the entire length which gave the children several opportunities to splash and explore in the water. Rain pants and rain boots are useful! 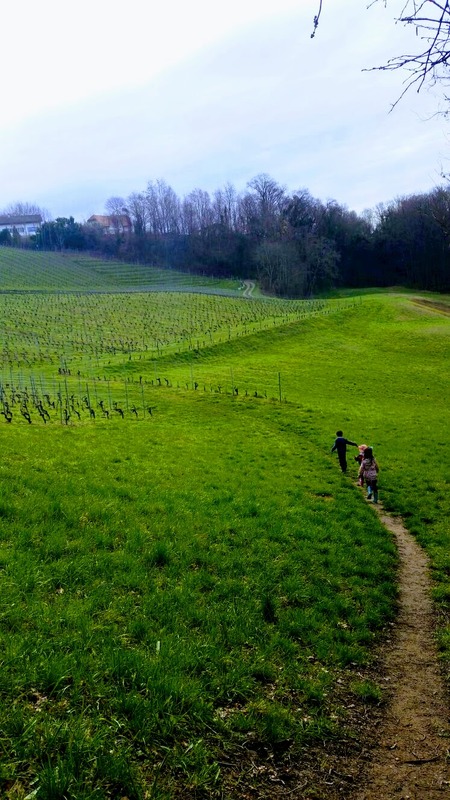 When not walking directly next to the river, you are either crossing a field, a vineyard or in the woods. And there is no shortage of benches along the way to rest your feet (or take a silly photo). Always look for either the trail name or the next town you are headed toward. For us, we were headed toward the "Morges Gare" so at the intersection photographed below we made sure to follow the appropriate arrow. About halfway through the walk you will come upon a pink/peach colored building after emerging from the woods. Look for the yellow walking man stickers and yellow diamonds (sometimes hidden a bit behind bushes) to stay on your path. At the pink building you essentially walk around the building to find the rest of your trail (it follows a paved road for a short time before entering into a field again). The walk ends in the beautiful lakeside town of Morges. We rewarded the children with ice cream on the waterfront overlooking Lake Geneva and the Alps and then a trip to the public playground before making our way back to the Morges train station. We then took the train from Morges back to the Vufflens Le Chateau gare (train stop). The hike was downhill the majority of the way which I find to always be helpful with children. And because it follows the river the entire way it is hard to get lost. 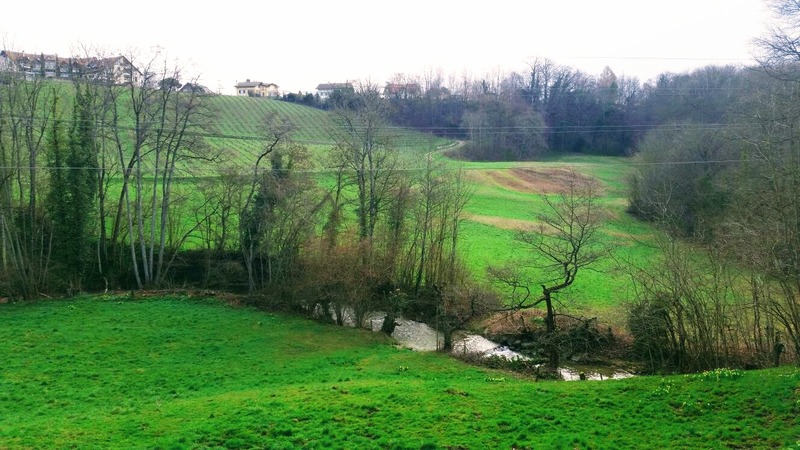 We walked 3.79 miles (6.06 km) from the start of the trail to its end at Lake Geneva. 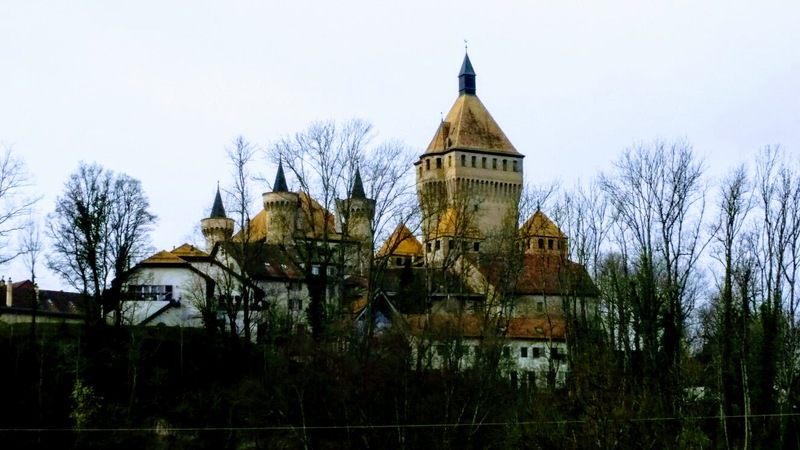 The train ride from Morges to Vufflens-Le-Chateau is less than 10 minutes and just a few stops. Once arriving back in Vufflens-le Chateau we admired the castle before getting in our car with tired but happy children from a day out in the fresh Spring air exploring.